It's been years since I last sat an exam. Back then, I would have been sat in an exam hall with pen and paper. 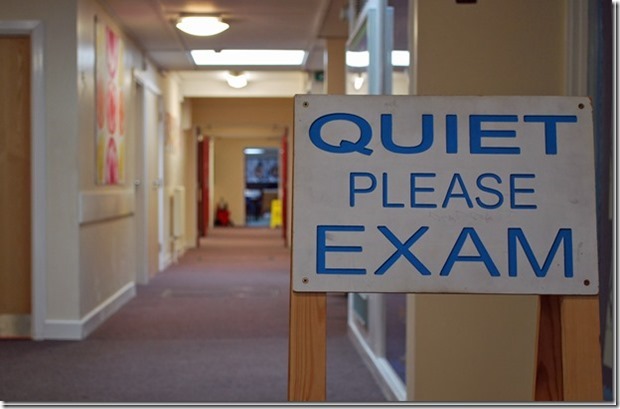 But things have changed and exams can be taken online – remotely monitored with a proctor watching via webcam and screen-sharing. Great – I don’t even need to leave the house! To take the exam, you start a webcam and chat session with a proctor at a company like ProctorU. They check your ID and you point your webcam around your workspace and around the room so they can see that you don’t have smartphones or any other way of cheating. It struck me that all those taking this “hacker” exam would be thinking about all the ways they could beat this system, if it weren’t for the “ethical” bit. 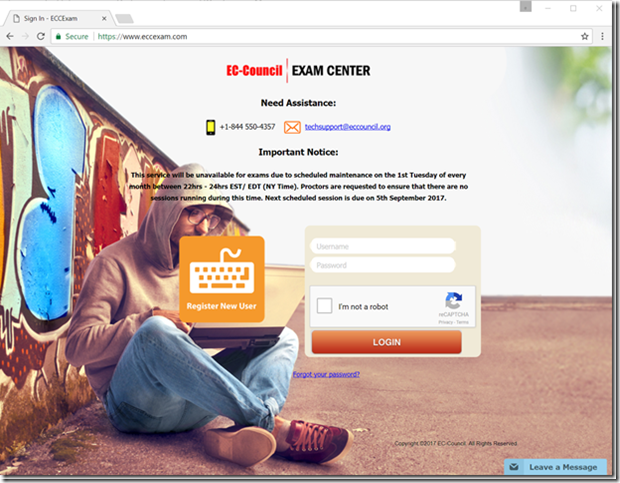 The proctor then takes you to the exam website where you log in, prove that you’ve paid with a one-time voucher code and select the exam that you’re taking. The proctor logs in and you accept various conditions (no break for four hours!) and you’re ready to start. I won’t dwell on the fact that the proctor is using credentials that are clearly common to everyone at the company – it’s not the first time I’ve seen that. As with all hackers, this one is wearing a hoodie but this is an ethical hacker so it’s beige. I went through this process and began my exam. There are 125 multiple choice questions to answer – select a radio button and click the Answer button and the website progresses to the next question. I’m assuming that this is a PHP web app by the file extension in the URL. It’s straightforward stuff – the browser submits the form and the website returns the next page of question and answers. There’s also a checkbox to mark a question for review and a drop down list containing all the questions that have been answered with a Review button next to it. I’m about 18 questions in and I think I’ve been a bit hasty on the previous question. I select it from the list and hit Review. That’s when I hit the first problem. Ok, so I get a page with an error message with SQL syntax error. I’ve redacted what would seem to be a database table name in the error message – I don’t want to be the one sharing their database schema around the web. Error: getRecordItem (<TABLE NAME HERE>), SQL request error #1 Incorrect syntax near the keyword 'AND'. Improper Error Handling is covered in the OWASP Top 10 under Security Misconfiguration but I don’t have time to worry about that during my exam. I get in touch with the proctor to see if they can help. They try refreshing the page and opening new browser windows and going back through the exam selection process but it’s no good – the error message seems to be here to stay. They escalate to a colleague who tries the same things with no success. My exam voucher code is single use so I can’t even restart the exam. At this point, the proctor says “We’ve sent an email to our contacts and they should contact you within three to six days” and I’m shocked. I can’t compare the stress levels now to those I had during university exams but the adrenaline is flowing. I’ve got a busy work calendar at the moment and rescheduling isn’t going to be easy. I’ve got a conference call following the exam. I go and get my mobile phone (having asked permission!) and call the EC Council helpline. I get various ring tones as the call is bounced around the world. There’s a delay of a few seconds and communicating is a challenge. A few emails and phone calls and some time later and my one-time voucher code has been reset and I can restart the exam. At this point, it’s an hour and a half after I first started and I restart the exam. I need to take more care as I answer the questions this time as I’m not going to risk trying to review questions later for fear of the same problem re-occurring. I make good progress and I have time to spare as I reach the end of the questions. I select the last answer option and hit the Answer button on question 125. Oh wow. My head is now in my hands as I start to think about what’s just happened. That error message again. I contact the proctor. I’ve been handed over to a new person so I have to explain the situation again. Browser is refreshed. New tabs are opened. Error remains. I fire off an email to EC Council technical support. The error message basically tells me that the answers are stored in a database so they should be able to retrieve them so I don’t have to re-sit the exam, right? We have reset your voucher code. Please reschedule the exam date for tomorrow. We appreciate your patience and understanding of this matter. I reply. Are they telling me that the answers aren’t stored in the database? We apologize for the inconvenience caused, we regret to inform you that as the exam was not submitted successfully due to the technical difficulties we do not have logs from your exam to issue you with your certification. We are happy to help you with the exam voucher of your choice valid for a period of 1 year and you can proceed to reschedule your exam with it. I’ve replied again and I’m waiting for a response. Did the application really fail to store any of my answers to the database? Why would I repeat any exam that’s so likely to lose my data and waste my time? If ProctorU recorded my screen for the duration of the exam, can we rebuild the data? For the answers to these questions and more, watch this space!